Home » World » Europe » Student Loan Forgiveness in the mind of White House! Student Loan Forgiveness in the mind of White House! In an attempt to kick-start the country into its former glory, US President Barack Obama has new plans to help the College kids to temporary relive them from the burden of Student loan after he received a petition signed with over 32k students in the platform ‘We the People’ which was initially created by White house to address the concerns of the nation. What is We the People Platform? The platform, called We The People, is open to anyone 13 or older. Once you create a petition and submit it to the site, it’s your job to build momentum for your idea using social media and old-fashioned word of mouth. If a petition reaches 150 signatures in 30 days, it because logged and searchable within the database. If the petition reaches 25,000 signatures, it gets an official response from the White House. The original threshold for a response was 5,000 signatures in 30 days, but it appears that the White House wasn’t going to be able to respond to all of the petitions that got that many signatures, so the limit was raised. The first petition to merit a response from the White House has just gotten its response. The petition for the Obama administration to “Forgive Student Loan Debt to Stimulate the Economy and Usher in a New Era of Innovation, Entrepreneurship, and Prosperity” currently has over 32K signatures on the We The People site. 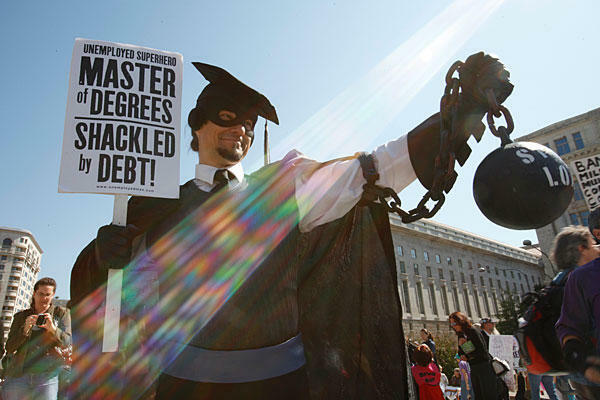 Forgiving student loan debt would provide an immediate jolt to the economy by putting hundreds and, in some cases, thousands of extra dollars into the hands of people who WILL spend it – not just once, but each and every month thereafter – freeing them up to invest, buy homes, start businesses and families. That’s what the petition’s creator, Robert A of Staten Island says about his proposal. The White House revealed they are taking steps to lighten the load of over 1.6 million students who are paying the debt. The plan, to be unveiled in Denver on Wednesday, is to cap student loan payments at 10 percent of discretionary income and bring the loan forgiveness law down to 20 years, versus 25. Obama aims to push up the start date from 2014 to 2012. Starting in January of 2012, those who take advantage of the cap will also qualify for a 0.5 percent cut on the interest rate on some loans, which will also aid in lowering the payment and can save them money in the long run. The Administration is moving forward with a new “Pay As You Earn” proposal that will reduce monthly payments for more than one and a half million current college students and borrowers. Starting in 2014, borrowers will be able to reduce their monthly student loan payments to 10 percent of their discretionary income. But President Obama realizes that many students need relief sooner than that. The new “Pay As You Earn” proposal will allow about 1.6 million students the ability to cap their loan payments at 10 percent starting next year, and the plan will forgive the balance of their debt after 20 years of payments. Additionally, starting this January an estimated 6 million students and recent college graduates will be able to consolidate their loans and reduce their interest rates. Of all the other schemes, Pay As You Earn seems promising to relive the students from some of their loan burden. However, the Loan is not cancelled. The Student has to pay the loan every month and so, till 20 years get passed from the date of borrowing the loan and after that the remaining part gets forgiven. Sounds ridiculous. Any Country that works in debt will die in debt. This is what i have learned out of my experience. If you are a college kid and you are reading this post. Dont fall for the loan scheme. Minimum or Higher amount, the loan will rip you off your everything and will leave you in the streets. Previous: Grand Theft Auto V is Coming!! iOS FB Messenger Gets Video Sharing! Hugh Jackman Quits Role as Harry Houdini! Opossum Immunity to Poisons to Help Humans? How our favourite dishes were named!